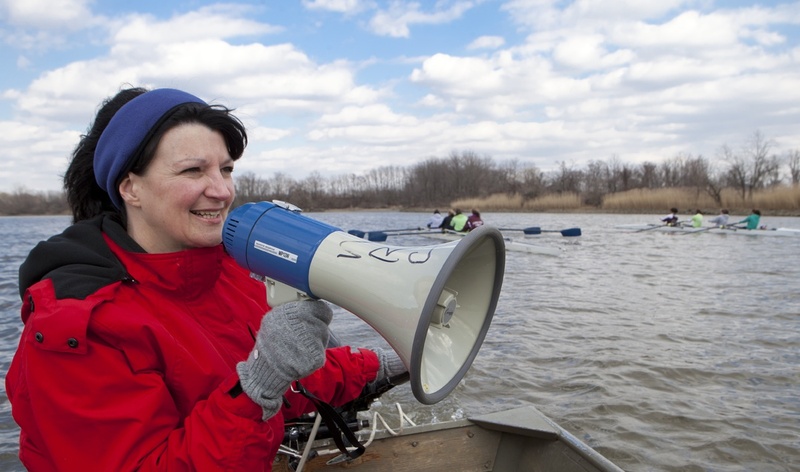 The air is cold, the water is colder, and there’s a look in the sky that says “snow.” Marie Lavoie Peters (’81 industrial administration) is in a motorized launch, megaphone in hand, calling out directions and encouragement to her high school crew team rowing beside her in sculls on the Christina River. 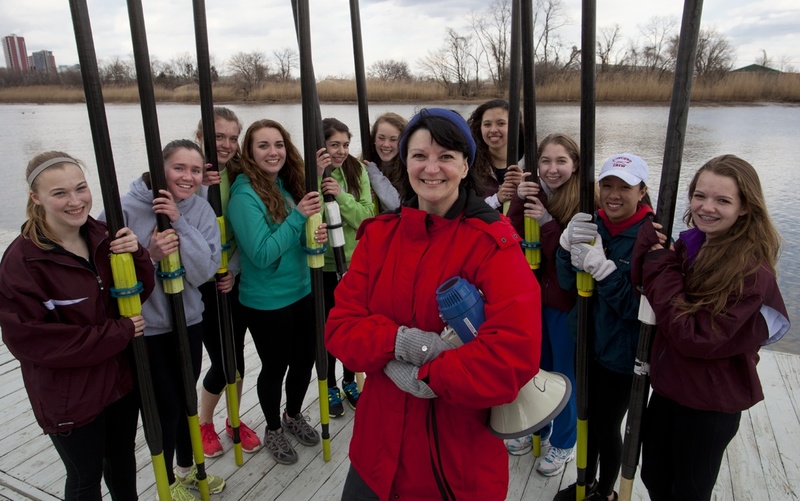 It’s what she’s done for 11 years as a coach and faculty adviser of the Concord High School crew team, the first one in a Delaware public high school. Although crew is a club sport at the Wilmington high school, the team competes in Philadelphia on the Schuylkill River against teams from Pennsylvania and New Jersey in the Philadelphia Scholastic Rowing Association. Marie has been teaching math at Concord for 22 years – she earned a math degree with a teaching certificate at Rowan University and a master’s in education at the University of Delaware. Growing up in West Des Moines, Iowa, Marie says she “never thought I’d live my life in Wilmington, Delaware,” but it turns out to be a great location, not just for rowing but also for its proximity. “You’re two hours from Washington, a half hour from Philadelphia, two hours from New York City, and an hour and a half from the beach,” she says. As a competitive rower herself, Marie started the co-ed crew team in 2002. The last two years she’s backed away partially from the team, hoping to allow others to take over the coaching reins. But she continues to stay involved as the program’s faculty adviser and the team’s most enthusiastic supporter. Marie’s husband, Mark (’80 computer science, ’82 mechanical engineering) is director of information technology at AstraZeneca. Their son Steven (’05 computer engineering) works for Microsoft; another son Mike teaches with Marie at Concord.